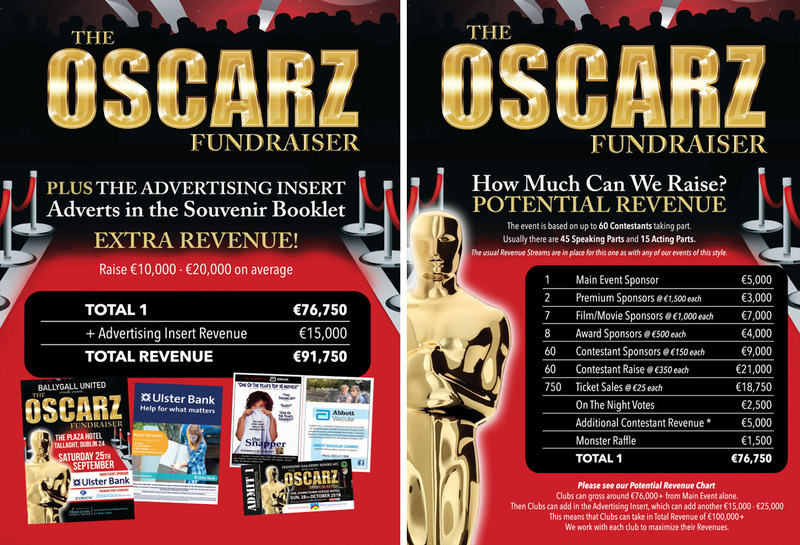 The Oscarz Fundraiser RAISE €100,000* IN REVENUE AND MORE FOR YOUR CLUB, SCHOOL OR ORGANISATION! Don't miss out on great fundraising ideas and our upcoming fundraising events across Ireland. Subscribe to our Newsletter (below) and keep up to date with us! The event is based on up to 60 Contestant's taking part. Usually there are 45 Speaking Parts and 15 Acting Parts. The usual Revenue Streams are in place for this one as with any of our Events of this style. Please see our Potential Revenue Chart Attached. Clubs can gross around €76,000+ from Main Event alone.